Posted by Kim May on August 2, 2017 under Baltimore Washington DB2 Users Group, DB2 Gold Consultants, Frank Fillmore, IBM Champion, IBM DB2 Services, IBM Information Management Software Sales, IBM Training Services Delivery Partner, TFG Blog. I just received an email from IBM’s Partnerworld program notifying me that as of August 1, 2017, The Fillmore Group, after ten years as a Premier IBM Business Partner (the highest program level), is now officially a Registered Business Partner, the lowest level in the program. We still have a team of expert consultants. We are still authorized to deliver most IBM courses in the Analytics brand family curriculum. We are still actively promoting, influencing and reselling IBM Analytics solutions. I am still Chair of the Baltimore/Washington DB2 Users Group and an IBM Champion. Frank is still a Gold Consultant. Several of our consultants are IBM Champions and Golds. IBM simply won’t programmatically acknowledge that our skills have value any longer. IBM claims to value partners with skills, but by they are lying. The truth is the two factors determining partner level in the new Partnerworld system are software sales and customer references. Is it a coincidence that IBM is struggling with sales (21 straight quarters of declining revenues) and the company has historically been terrible at getting customer references? Sadly, great technology followed by poor quality and expensive implementations and enablement support don’t add up to gushy customer success stories. In the new program, without sales of $1,000,000 or more in a single product family a Business Partner cannot be granted a product “Competency” designation – no matter how many times they have implemented a solution, how many customers they have trained, and/or how many presentations and webinars they have delivered to help current and prospective customers understand the value of IBM’s solutions. In the new IBM world, that’s not “competency”. So like many of IBM’s “reinvention” efforts over the past five years, the “new” Partnerworld program is essentially the same old program, with new, onerous requirements designed to eliminate specialty partners (like The Fillmore Group) and I suppose reduce IBM’s burden of managing their partner network. Because like who needs an extensive network of partners promoting an incredibly complex portfolio of products and solutions?? Heck, why not just funnel business to a handful of partner organizations and keep things simple. Maybe reduce channel support headcount by 10 or 15 people. Woohoo. Think small. 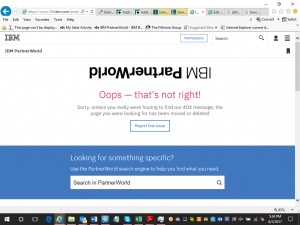 After I received the email notifying me of our program level demotion I tried to log in to Partnerworld to review the program offerings for our new, low level. And like so many things in today’s IBM world, the response was sad, heartbreaking and terribly frustrating – apparently they can’t keep the program website up. Need a high availability solution?? ?